Intel CEO Brian Krzanich today announced that its next-generation Xeon Scalable (Cascade Lake) processors and its 8th-generation Intel Core processors will feature redesigned components to protect against the Spectre and Meltdown vulnerabilities that affect all modern processors. 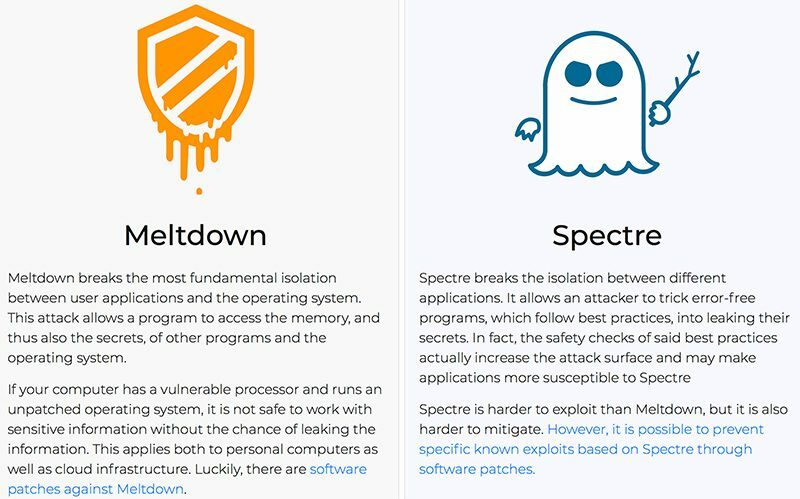 Spectre variant 1 of the vulnerabilities will continue to be addressed in software, while Intel is implementing hardware-based design changes to offer future protection against Spectre variant 2 and Meltdown variant 3. We have redesigned parts of the processor to introduce new levels of protection through partitioning that will protect against both Variants 2 and 3. Think of this partitioning as additional "protective walls" between applications and user privilege levels to create an obstacle for bad actors. Intel's new Xeon Scalable processors and its 8th-generation Intel Core processors are expected to start shipping out to manufacturers in the second half of 2018. Ahead of the hardware changes, Intel says that software-based microcode updates have now been issued for 100 percent of Intel products launched in the past five years, and all customers should make sure to continue to keep their systems up-to-date with software updates. Krzanich also reaffirmed Intel's commitment to customer-first urgency, transparent and timely communications, and ongoing security reassurance. Apple began addressing the Meltdown and Spectre vulnerabilities back in early January with the release of iOS 11.2, macOS 10.13.2, and tvOS 11.2, which introduced mitigations for Meltdown. Subsequent iOS 11.2.2 and macOS High Sierra 10.13.2 Supplemental updates introduced mitigations for Spectre, as did patches for both macOS Sierra and OS X El Capitan in older machines. Apple's software mitigations for the vulnerabilities have not resulted in any significant measurable decline in performance. I was going to buy a new MacBook in January until all this came to light. Can’t wait for new MacBooks now! Wait, Idk there were different Meltdown and Spectre variants. I guess I'll wait until 2019 to get a new Mac. It's a non issue for 99% of the world. Nobody is going to target the average person. There's nothing to gain. If I were going to exploit this flaw (which is pretty hard by the way), it would be on a Fortune 500 company, bank, intelligence agency or government agency that would net me something for my time and energy. Not to see your pr0n or access the $500 dollars you have in your bank account. 8th-gen Core? Aren't kaby lake refresh, kaby lake G and coffee lake vulnerable to Meltdown and Spectre? Is Intel going to call Cannon lake 8th-gen Core? Intel really should clear their naming scheme. Intel's 8th Generation is Coffee Lake, which is already released. So does this article mean 9th Generation? EDIT: This article is poorly worded and needs to be revised, as it is incredibly confusing and misleading. Linus Torvalds seems to have got early design specs, and he was let's say deeply unimpressed. It seems that Intel's new chips can be switched to a fast + unsafe mode, or to a slow + safe mode. And by default they are running in fast + unsafe mode. Important to notice that MacOS (and Windows, and single user Linux) are not affected because these attacks allow _attacking other users_ on the same machine if you have malware on your computer. For a single user computer, this doesn't add any new problems. Malware can attack the single user on a Mac anyway; being able to attack a second user is of very little importance. "Apple's software mitigations for the vulnerabilities have not resulted in any significant measurable decline in performance." So far the performance has gone down progressively with Mac OS updates over time so I haven't realised but it was quite evident when I ran Geekbench before and after the upgrade with no other changes to the default installation. The crux of the problem is that speculative execution wasn't checking for memory protection bits. The only way to fix this is to check the memory protection bits, which introduces latency in that particular critical path. For most users this is completely unnecessary, which is why they have the unsafe mode. The software 'patch' for this is basically to use a separate stack for any system calls, which is slow because it requires flushing the tlb.